We got a little visitor yesterday. His name is Stanley. Flat Stanley, to be exact. I'm sure many of you have been visited by Stanley. He travels around the world in an envelope. With each stop on his journey, his host shows him their city and documents this adventure in his travel journal. After the visit is complete, into the envelope he goes, and he's off to his next destination. We introduced Stanley to the Lamms yesterday. Baxter took to him right away, but Zelda is not so sure about this little stranger. Stanley will be with us for a couple of days before he returns to his hometown in Iowa, where he lives with Sophie, my cousin Christy's daughter. We promise to show him a great time, Sophie! If he returns with nibbles on his ears and rumpled clothes, that just means he's been wrestling with kittens. They can get a little rough at times! To learn more about the Flat Stanley project, you can visit HERE. I would be more then happy to have Stanley here in Toronto Ont. Canada. what a cool project! Good luck, Stanley!! Be very careful in the Lamm Nap Puddle. Btw, jut saw Ms Bean's tweet.. Could we see a pic of the handsome tabby boy in it pls? Maybe next time he comes.. Has he ever met Ms Bean in person? Ha ha ha....I love it. Flat Stanley came to visit my hubby and I years ago. We had fun with him. I'm sure Stanley will have lots of great kitten tales to tell when he gets home. Thanks for sharing! Will we get to see Miss Charlene with Flat Stanley? LOVE Flat Stanley :) Give him purrs from California! Hehehe.. I have a grand-nephew in MI who thought that since Aunt Susie travels a lot for work, that Stanley should go visit her. Stanley went on a few great trips with me, including being 'honorary pilot for a day' on a flight from Sacramento to LA. I just wanted a picture with the pilot, but he took Stanley and my camera into the cockpit, and Stanley has a great picture of himself in the window careening over downtown LA. Nice pilot. And of course nephew Ethan thinks that Aunt Susie is pretty neat. 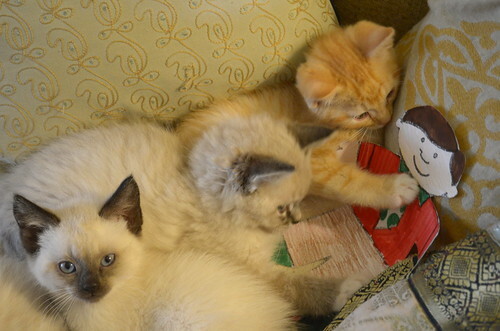 :) My cats, however, did not care for Stanley and declined pictures. Brats. Ah, Stanley definitely gets around! He came to Maui around the end of last year. My nephew was not too happy to speak the Hawaiian words in the report I sent in when I sent Stanley back. Ooopsie.